Getting from point A to point B doesn't have to be a frustrating, laborious task, especially when websites and apps as useful as MapQuest exist. MapQuest offers detailed driving directions that will give you turn-by-turn audible directions from your cell phone. Sometimes, however, you'll encounter "dead spots" where your phone loses its connection. Fortunately, MapQuest allows you to print out directions to take with you on your journey. There are several different options for these useful maps, including filters that show information for cars, buses, and walkers. To begin, enter your starting address under Where are you starting? and an endpoint under Where are you going? , such as an address, business, or public landmark. You can add places in between by clicking Add Stop. You can choose to have MapQuest show you a round trip or even a reverse route, so you know how to get back to where you came from. Click on Route Settings to choose between miles and kilometers and to optimize your route to avoid toll roads, highways, ferries, seasonal roads, timed restrictions, and country borders. You can even choose to generate an amount for IRS fuel reimbursement. Once you've chosen your route, click Get Directions, and MapQuest will retrieve a map for you. You can choose to edit that map by dragging the route line with your mouse, searching nearby, or adding filters (find lodging, restaurants, activities in the area, etc.). Click on the green View Route Directions button to see a turn-by-turn route. At this point, you'll see several links above the directions. Choose Print to generate a hard copy of your route. You also can send your route to your cell phone or share it on Facebook or Twitter. MapQuest even provides a link to share in any way you please, as well as a code to embed it a website, if you so choose. Cell phone and satellite coverage continues to expand and improve. Still, however, you're likely to encounter some places where your navigation program — in this case, MapQuest — will generate the dreaded "connection lost" message. If you don't have printed directions, you might be lost, too. Printing out your directions before your trip gives you a point of reference in case this happens. Plus, if you simply prefer to rely on a hard copy rather than directions from a digital device, printing your directions ahead of time lays out your trip in the format you're most comfortable with. Need even more maps and MapQuest options? Here are a few useful links. 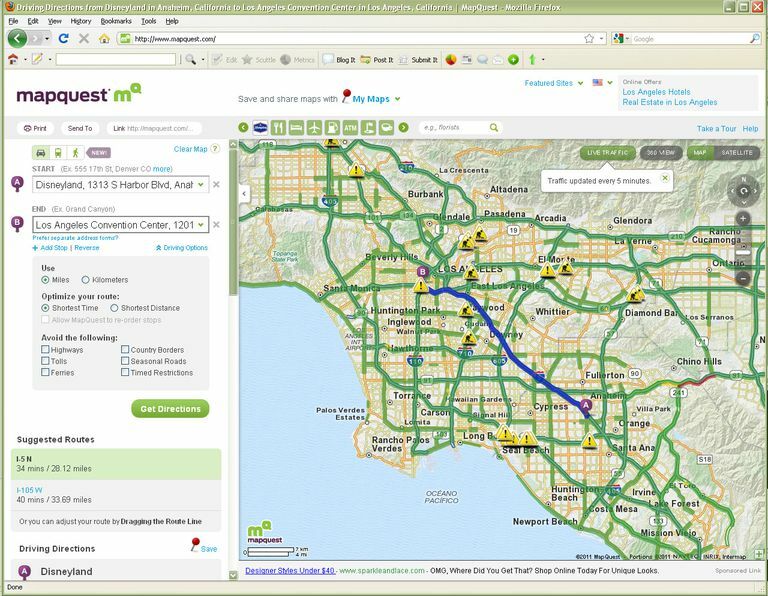 MapQuest Maps: Get a detailed map of a particular address in the U.S. or Canada. MapQuest Gas Prices: Need to fill up? Check the gas prices in your area before venturing out. See the lowest and highest prices in your area, and check a gas calculator that figures out your mileage and gas usage. You can also filter exactly what kind of gas prices you're looking for, from diesel to alternative fuels. Your maps can get as streamlined or as fancy as you would like them to. For example, you can view your maps results in a Live Traffic, Map, or Satellite view. Zoom in to get a better, more detailed view of local attractions, neighborhoods, or streets, or zoom out to get a big picture look at a suburb, a park, or a city. If you need to make detailed directions that include more than just a couple of stops, you can use the MapQuest Route Planner. This is especially handy if you're going on a sightseeing expedition. Add as many stops as you would like, and MapQuest will optimize your route so you spend less time driving. Simply type a location (city, country, etc.) into the Mapquest search field, and you'll instantly get a detailed surface map of your geographical location. Click on the green icons at the top of your map to add restaurants, coffee shops, bars, movie theaters, etc. You can add extra layers to your map by clicking on Satellite or 360; both add different imagery to the default map view. You can easily switch the language of your map with the dropdown menu near the top of the page; a tiny flag indicates the language you have selected. Type in the name of a country to get an atlas-like view of Europe in which you can move around with your mouse; double-click on the area you'd like to explore. MapQuest offers international sites for specific countries: France, Germany, Italy, Spain, and the U.K. Here, you'll discover a fantastic atlas that lets you explore any country in the world via maps and interactive features with geographic-specific statistics.